It’s simply impossible to get chemical-free water from a plastic bottle. Even small amounts of bacteria at bottling can multiply to a much larger problem by the time the product gets to you. It’s unrealistic to think that water bottled in plastic containers, produced at a bottling factory, transported and stored at high temperatures for months at a time, can be purer than what a basic home water filtration system can deliver. And at least two out of every five bottles of water sold around the world are simply filtered tap water. Tap water is constantly moving, staying fresh and never stagnating. It is also filtered, disinfected, and is tested many times a day. In contrast, no filtration or disinfection requirements - and virtually no international quality standards - exist for bottled water. 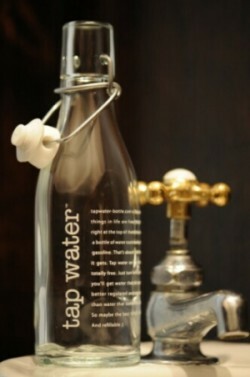 A water filtration system and the refillable tap waterTM bottle is a simple, clean solution.